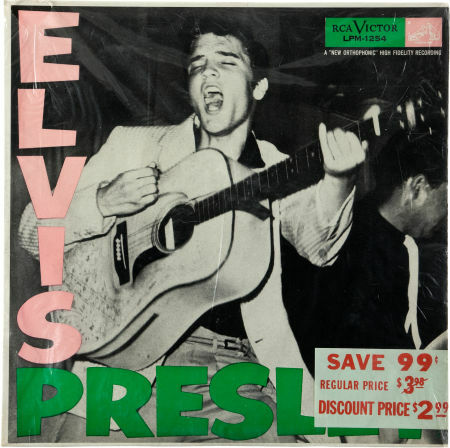 A sealed copy of a first pressing of Elvis’ first album (RCA LPM-1254, 1956), which contains Blue Suede Shoes. The auction estimate is $3,000 “and up”. 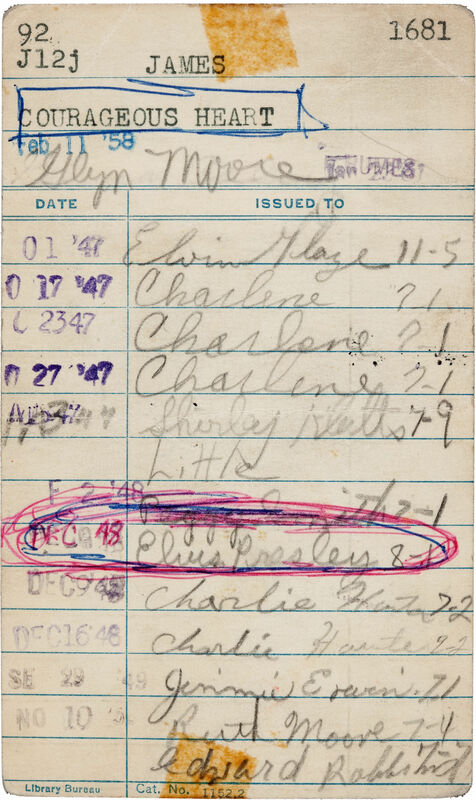 If you prefer something more intimate, there’s Elvis Presley’s signature on a Humes High School library card from 1948. 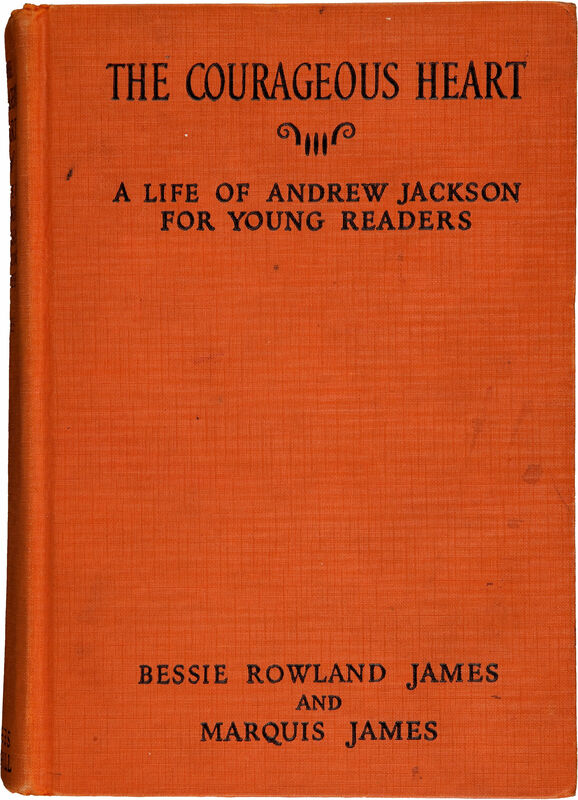 The card proves then 13-year old boy who would become The King checked out a copy of The Courageous Heart: A Life of Andrew Jackson For Young Readers. The card was discovered years later by a Humes High librarian while clearing some old books from inventory and is offered with the copy of the book along with a COA from Richard Consola. Estimated value is $4,000 — and up. 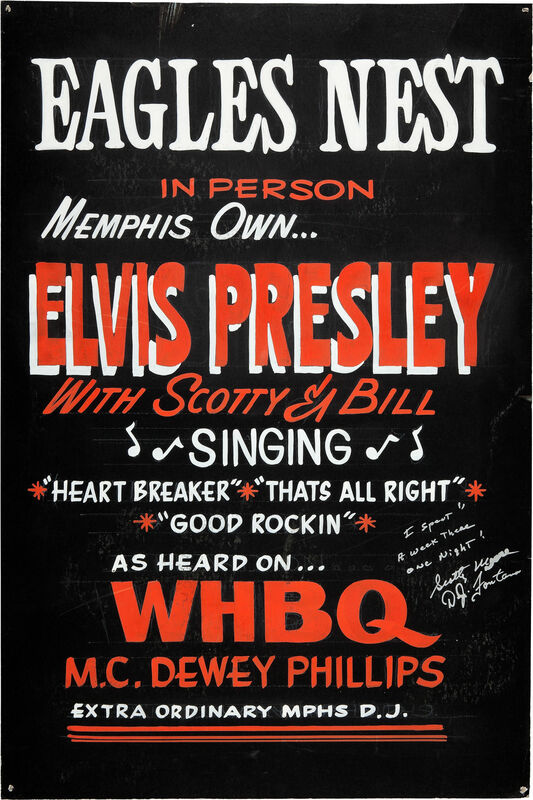 For your wall, a hand-painted concert poster promoting the December 10th, 1954, performance at the Eagles Nest nightclub (located on Highway 78, outside of Memphis) which was previously owned by Los Angeles KRTH-FM (101.1) disc jockey and Elvis aficionado, Brian Beirne. (The vintage concert poster is also signed by Scotty Moore and D.J. Fontana.) Auction estimate is at least $30,000. A 1950s Country & Western band from Harrisville, Rhode Island, named Uncle Jim and the Westones sometimes played gigs at county fairs in Tennessee, appearing on the same bill with a young upstart named Elvis Presley who occasionally sat in with them. After an occasion where Elvis played this very same resonator guitar, he signed it for its owner, Westones leader Jim Riley. The signature is between the slots on the headstock of this beautiful, original instrument. Presley apparently used a blue ballpoint pen and he pressed down hard enough to break though the varnish and leave a deep, permanent impression into the wood. Careful viewing shows much of the blue ink remaining. Auction estimate on the guitar is $5,000 and up. Two pages, mimeographed copies of the original typed document, dated “March 5, 1956,” outlining the agreement Hal B. Wallis and Joseph H. Hazen of Paramount Studios made with the then 21 year old Presley as he was embarking on his film career; eleven ‘boiler plate’ points are listed, including salary [“First yearly period $15,000 / Second yearly period $25,000,” etc. 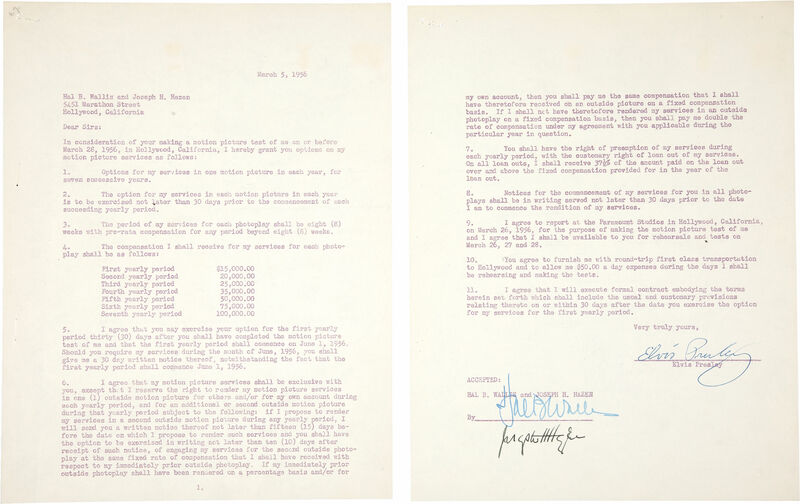 ], transportation [“You agree to furnish me with round-trip first class transportation to Hollywood and to allow me $50.00 a day expenses…”], and other like terms; signed on the second page in blue ballpoint ink “Elvis Presley” and in blue and black fountain pen ink by the two producers; this document was likely a file copy as it’s mimeographed, though all signatures are actual ink on paper. 11″ x 8.5″. COA from Rich Consola. Estimate: $8,000 – up. 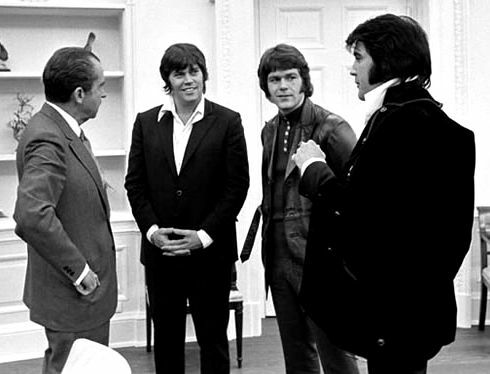 If iconic American moments are your thing, how about the suit Sonny West, Elvis’ friend and personal bodyguard, wore during that historic meeting between Elvis and President Nixon in 1970? It may not be Elvis’, but it was literally darn close! The auction estimate is over $6,000. Previous Previous post: How Has The Recession Affected The Market For Collectibles?